I’m thrilled today to be sharing the renovation of our Jack and Jill style bath: a navy and white bathroom with brass and wood accents. Thank you to Floor & Decor for sponsoring this post! All opinions are my own. Today is not about the endless tile dust that settles over every square inch of your home. It’s not about fact that at 8 months pregnant I spent three weeks bending over the bathtub to brush my teeth. And it’s not about the last-minute assembly of my daughter’s nursery since we removed the plastic that was blocking that room only two weeks before she was born. Not because I want to complain or because those things are really all that dramatic, but because they were worth it. 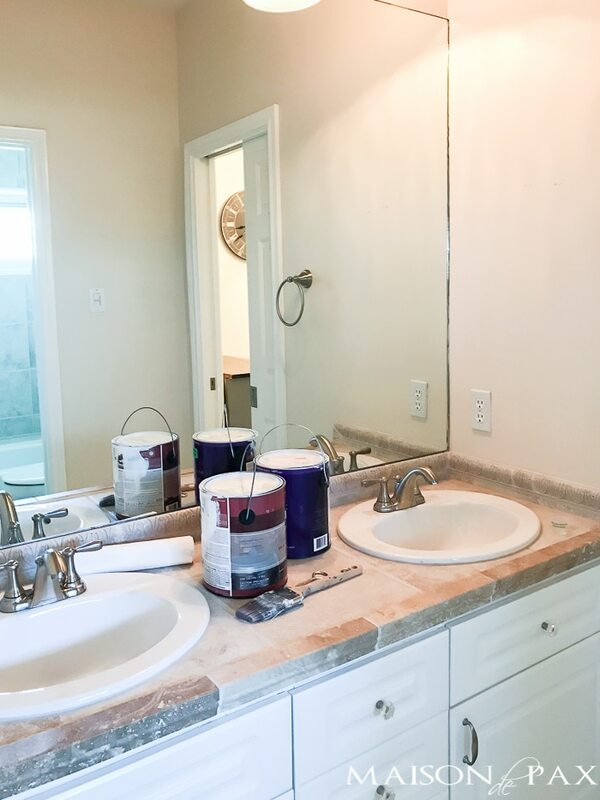 We started with a fairly basic builder-grade look: beige faux travertine tile on the floors, counters, and walls, a full wall mirror, and a white vanity. Floor & Decor was the perfect resource for the first two (and I promise more details about #3 soon!). 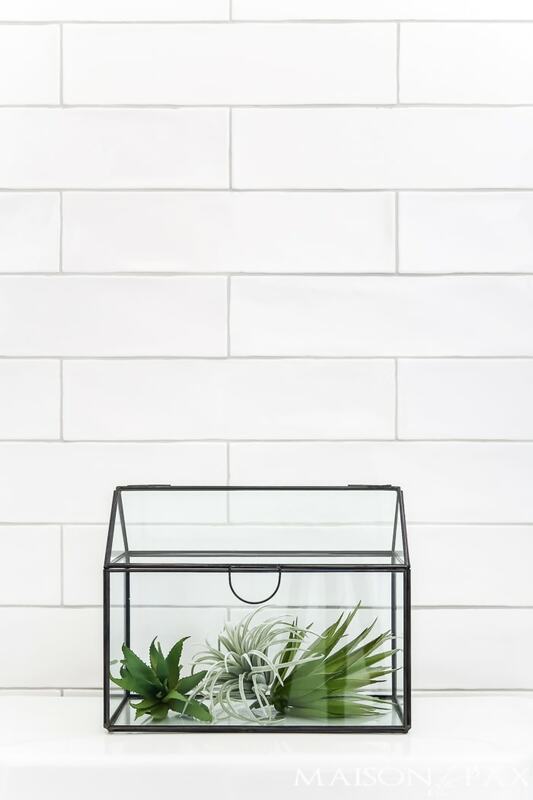 I took advantage of their free design services and spent time comparing lots of options with the in-store consultant at my local store to choose this beautiful white tile. I love the brightness that the high gloss of these tiles brings to the room and the character in the uneven surface and edges. I balanced the high gloss walls with these tumbled marble hex tiles on the floor, and this marble countertop. I originally was planning on a quartz counter, but the one I wanted was out of stock when I needed it, so the store helped me choose this gorgeous marble as an alternative. Remember my inspiration post with the designer spaces I loved? 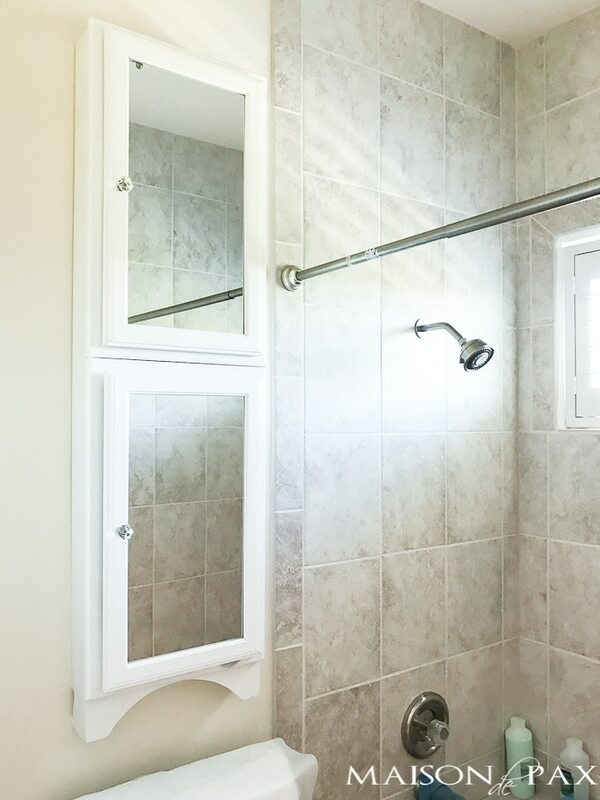 I’m thrilled to say that the end result is just what I wanted, and with the great prices I found on the tile and countertops from Floor & Decor, it was done with a very reasonable budget. I promise tutorials on the DIY portions of the space soon as well as a full list of sources (Update: full source list now available here! )… But for today, I just want to relish the transformation. Find the Floor & Decor store nearest you here, and let me know if you tackle a renovation in your home. I love to see my readers’ before and afters! Oh, that vanity is to perfect! I am in planning stages of a bathroom re-do and I am debating between white and blue for the vanity. You are definitely making a great case for blue! I am so glad it was helpful! It’s a beautiful redo! Love the colors. Did you have to re-sheet rock after you took out the old tile from the shower area to put up the new tile? Thank you! I confess that since we contracted it out I didn’t pay very close attention, but I believe they put up new cement board around the tub before installing the new tile. Stunning! 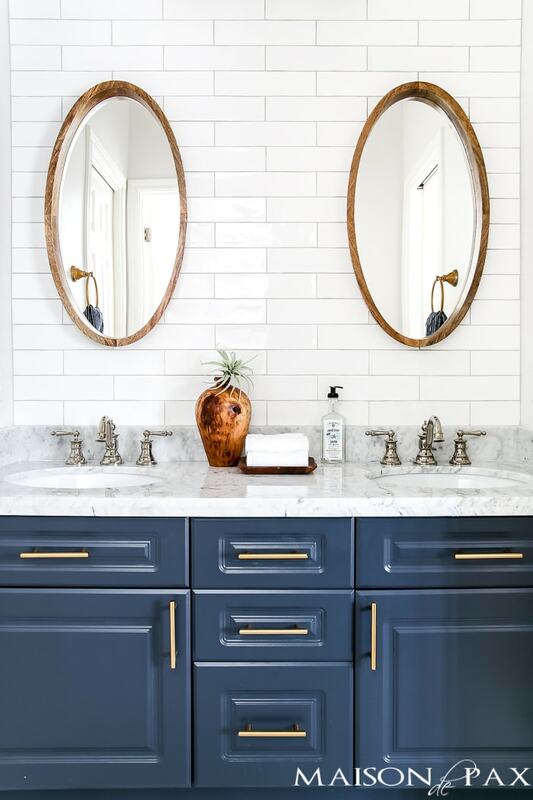 I love love love those countertops with that vanity color! It’s beautiful!! It’s so clean and crisp looking. 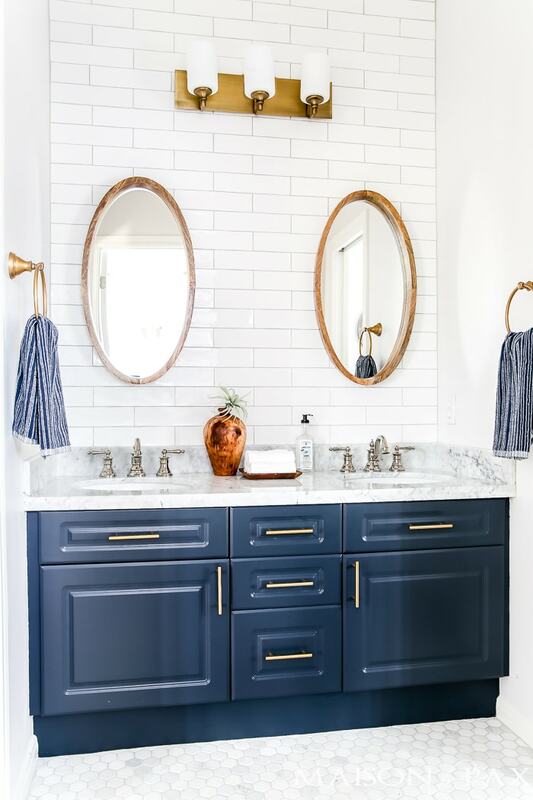 I am especially in love with the navy cabinets! Love the BLUE vanity! That paired with the slightly textured tile really makes that room shine! Beautiful! I love the air plants, especially the one in the olive wood vase. What a great place to put them, where they will get plenty of humidity from the shower! It’s beautiful!! Would you mind me asking where you got your shower curtain? The decor is awesome! Thank you so much! Here is an affiliate link for the shower curtain. This is beautiful! Where is your shower curtain from? Did I miss the link? where is the shower curtain from? Beautifully done!! Love this! Where is the shower curtain from? Beautiful! What color are your cabinets? The color is Polo Blue by Benjamin Moore. Best bathroom redo I’ve ever seen!! Tho you don’t know me , I can tell you that that is saying a lot! :-)Of course, slight disclaimer: Cobalt to Navy have been my go to colors for years – and years! Thank you for sharing! Thank you so much for sharing! We are loving the new space. Beautiful! 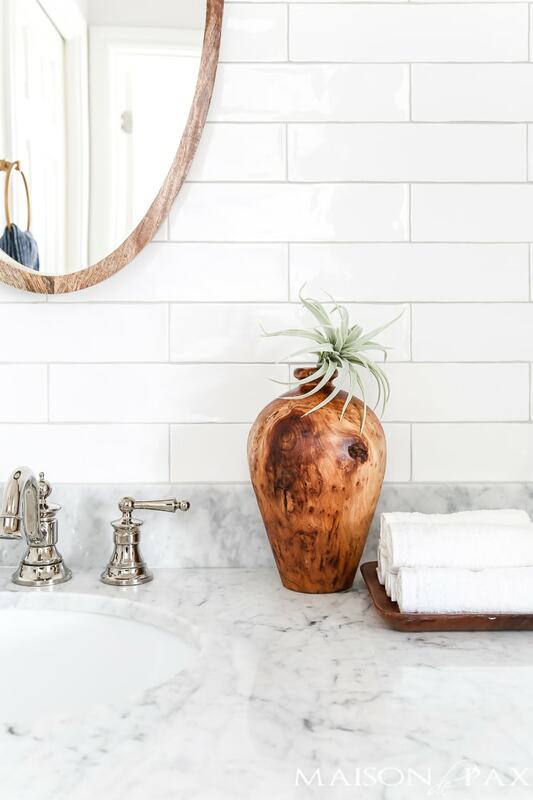 Is your grout grayor white? I would like to hear your thought process on using the brass vanity pulls and towel rings with the chrome faucets and other chrome hardware. Ps- Love your floor and countertop! I really like the casual look of mixing metals and I think it works for this space! Plus- hardware isn’t permanent, if the style changes, you can change the hardware too. absoutely beautiful! I have used Floor & Decor for projects in 4 different houses. Their prices & selection can’t be beat. I agree! Thank you, Barbara. I love everything! Where did you get that shower curtain? Your bathroom is stunning!!! I’m in awe of your Navy vanity!! Could you share the color? Gorgeous remodel!! Where did you get that olive wood vase? It’s stunning! 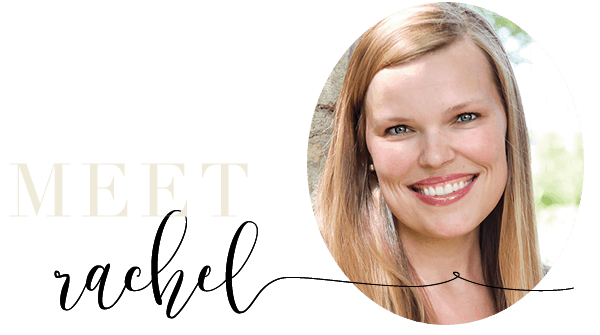 Rachel, that is stunning! The attention to detail is flawless. So clean and modern but with a touch of tradition thrown in. Well done! Hope the baby is behaving. Thanks! She is a doll. It is gorgeous. I love the blue cabinets. I hadn’t really considered that color before, but now that I’ve seen yours it’s a contender for our master redo. I need to go walk through our local floor and decor. I am so glad you found it inspiring! Thank you! Absolutely beautiful. I’d never leave the bathroom! I love the color, I’m thinking about painting our kitchen island navy and this gives me the inspiration. Thanks Amy! It would be beautiful on an island too. Where did you get your oval mirrors? I love those! The whole bathroom looks gorgeous! I really like that shower curtain. Will you share where you got it? LOVE LOVE LOVE!!! Never thought about painting my white cabinet base blue—but I LOVE yours! Looking forward to that post! And you are AWESOME doing all this while 8 months pregnant!!! Thank you Cathy! I am thrilled with the results. Love the results! I’m at the end a similar bath redo. Where can you get this shower curtain? It’s perfect! Love the results! I’m at the end a similar bath redo. Where can I getthis shower curtain? It’s perfect! By Jack and Jill bath, do you mean, doors from the bath to EACH of two bedrooms? Not just the two sinks thing? Thanks! We had a bathroom like that, only I gather it was a “Hollywood bath” — connected hall to bath to our room. But we were eventually able to convert that to two baths, which was lovely (for us, anyway). Because we were sharing it with three of our daughters, and we had to close and lock two doors every time we used it. But it was a pretty large bathroom to begin with. Yes! I have heard those called continental bathrooms too. I think they are helpful when you don’t have a true master. OMG! I love your bathroom!!! Just beautiful! Reminds me of mariner color decor. How did you remove your large mirror? Ours is 2-3x that long and kinda nervous abt moving it. Aren’t you supposed to criss-cross tape across to keep from shattering? Anyway, great job! Can you share the dimensions of the vanity and size of the sinks please? Hi! Yes- the vanity is 60×22, and the sinks are 17wx14d. 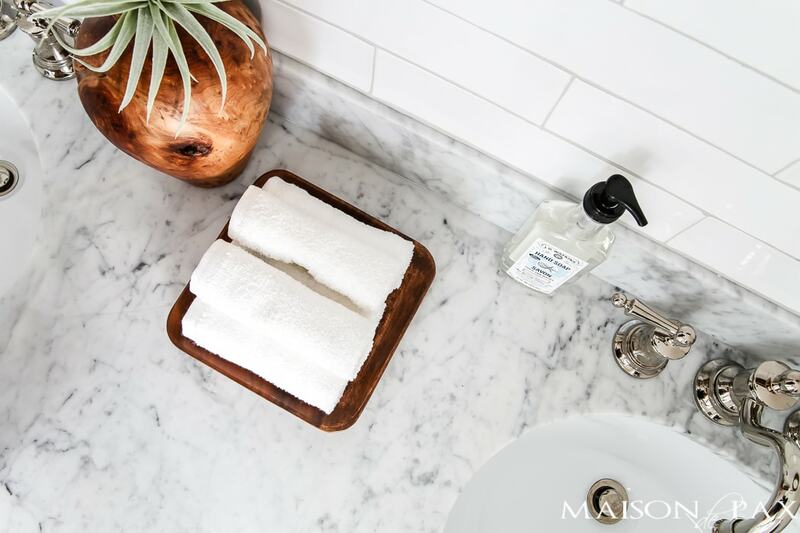 looking to find those pretty navy and white towels. Where did you find them? 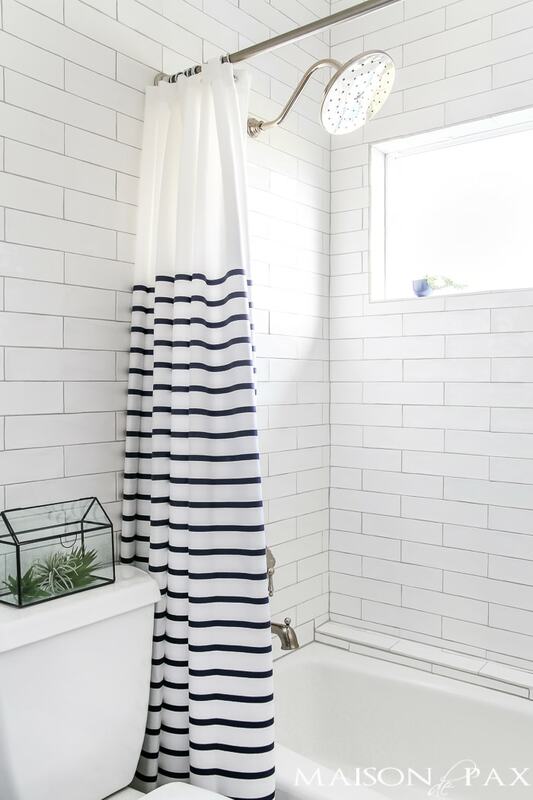 Where can I find that navy and white striped shower curtain?